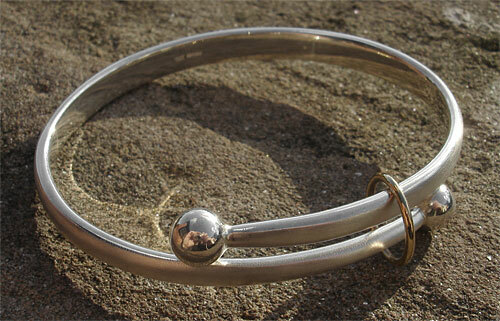 Women's Beautiful Gold & Silver Bangle : LOVE2HAVE in the UK! 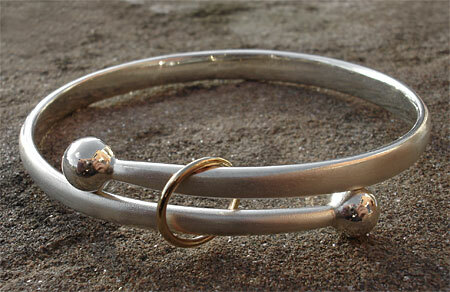 This beautiful bangle is created from a slick tapered silver wire finished on either end by a very shiny silver ball. It comes in solid sterling silver with smooth shaped edging for comfort and an attractive matt finish, in contrast, to the polished silver balls that reflect their surroundings. The crossover design is very clever and looks beautiful when worn on the wrist and the design allows the bangle to fit most people. The wire width is about 5mm wide. For that added designer touch the bangle is completed with a 9ct polished gold ring that runs freely over the silver but not over the balls so that it won't disappear to the bottom edge and remains in view for everyone to admire. Metal(s)/Material(s) Available: 925 sterling silver and 9ct yellow gold.